I couldn't have said it better myself so I am re-posting today's blog by Crazycrawfish. Note the referrence to Stand for Children - when John White can't figure it out himself, he defers to Michelle Rhee's people (after all she is a former TFA). My apologies for publishing so many articles so quickly folks, but I’ve been getting a lot of material lately to go through and some of what it reveals is truly astounding and needs to be shared. I recently published an article on how the most recent release of SPS scores was inflated simply due to a new test being introduced with a higher average base score. This caused all schools with grades 9-12 to receive inflated SPS (School Performance Scores) and letter grades and gave people the false impression that our schools were doing better. Essentially John White just gave every high school an average of 11-13 point increase where about 15 points is a new letter grade category. White then produced multiple press releases crowing about his success. I figured it was a lost cause to try to explain the nitty-gritty details about how this was happening and just let it go. I predicted this would happen in earlier posts, but I didn’t really have the numerical proof nor the professorial chops to explain and be credibly accepted. However recently we’ve had some very gifted folks (namely Dr. Mercedes Schneider and Herb Bassett) expose White’s SPS shell game for the con it was. However White’s machinations and manipulations of our scoring system have not stopped there. If anything, that fraudulent mischaracterization was just the warm-up for something truly audacious, the coming 2013 scoring bonanza! This will be the year most of our F and D schools will leap the rankings to C and B status without doing a single damn thing different. In fact, many of these schools may actually decline in dramatic ways but to all appearances they will be improving. Herbert Bassett does an excellent job explaining what scores would look like using existing data to do a side-by-side comparison of what scores would look like under the old method and the new method John White has proposed that will punch his ticket to ride out of our state on the wings of his fictionalized success. In its purest essence, the new School Assessment System is just another manipulation of School performance Scores to further the narrative of the school reform / privatization movement. The new School Assessment System shifts emphasis from improving all students to focusing on only those who are below grade level. The lowered values given high achievers (Advanced for the iLEAP/LEAP, Excellent for the EOC) tends to lower the scores of highest performing schools; the lowered grade scale tends to boost more low performing schools out of the F category. 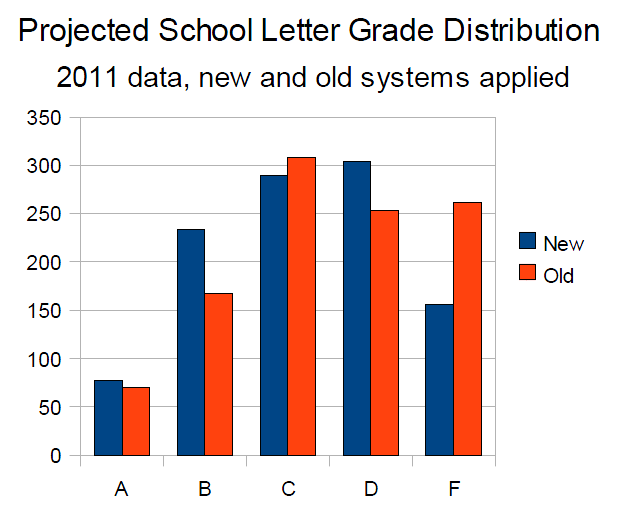 Without any change in student achievement, this is narrows the gap through the design of the system. (see chart below) What change in student achievement that it does encourage focuses only on the low performing students. inflation becomes more pronounced. Details and discussion are provided in this document. I will summarize a few of his points, but this report is a nice piece of work and I highly recommend reading it if you have a vested interest in Louisiana, education, children, teachers, local school districts, or if you think John White is really looking out for the interests of children or interested in actually improving education. Based on this report, there is little doubt John White is interested in “claiming” he has improved education for Louisiana. This is a very ambitious transformation of the scoring system that strongly favors and boosts low performing schools. To the causal observer, just looking at his meaningless “letter grades” it will appear that our schools dramatically improved. The reality may actually be the opposite. Now to continue with Mr Bassett’s intro. . . The new School Assessment System at first glance seems tougher than the old. The narrative offered by John White reinforces that idea. In reality, at least for the K-8 schools, it is quite the opposite. The apparent source of his new School Assessment System is STAND for Children, Louisiana. Achievement” tells another story when examined closely. Raising the Bar. Increasing Expectations… Baloney and spin. 1) inflate the K-8 School Performance Scores (SPS), 2) lower the scores of the highest performing schools and raise the scores of low performing schools in order to narrow to gap between high and low performing schools without any real change in actual achievement, 3) shift the emphasis from developing all students including high performing students to improving students who are below grade level, and, 4) provide business to the standardized testing industry. Below is the link to Raising the Bar: Increasing Expectations, Increasing Student Achievement. Basically Bassett points out over the course of his analysis is that K-8 scores of low performing schools will be drastically inflated by a letter grade or more. This will actually just boost them up to the level that the new tests White implemented this year for High Schools were raised to. However, it appears most of the changes are slated in the favor of low performers. This will have the added bonus of seeming to narrow the achievement gap by reducing much of the benefits and bonus that applied to high performing schools. John White is using fun house mathematics. He’s making the good schools look at themselves through the mirror that makes them look fatter than they are. 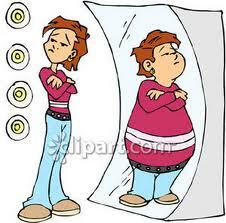 . .
. . .and letting the fat kids look at the skinny mirror. Then he plans to take these photos and show them to the public as say “equality achieved!” I don’t really have a solution for you. This is just how it is. 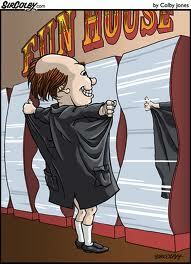 Enjoy your “success” Louisiana legislators and BESE members. I can honestly say that in this case, you earned it. If you allow this absurdity to take place John White will be leaving less than a year after these 2013 scores come out. Bank it. But you will still be here and the mirrors will be gone. You will be remembered for what you’ve done. . . and what you haven’t.